In manufacturing, assembly plays a key role in making products. 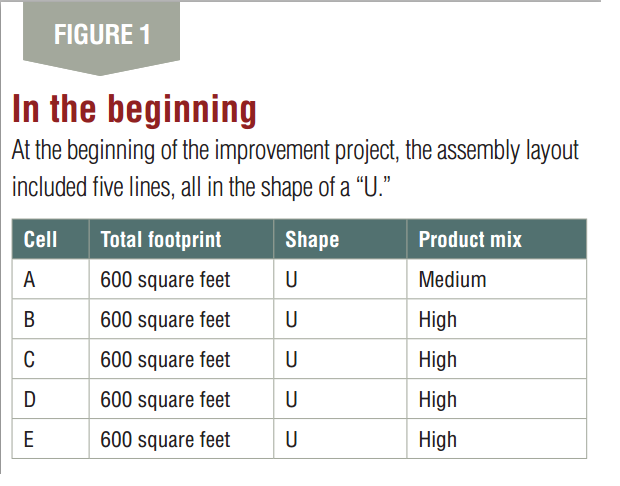 The layout of assembly lines must take into account material flow, along with the products’ size, complexity and shape. The lines can be straight, “U” shaped, circular, “L” shaped or any other possible combination. The productivity and output of assembly lines are influenced by factors like setup time, batch quantity, the extent of automation, the pace in cases of manual assembly processes, bottleneck stations and material presentation at the point of use. The following case study involves revamping assembly lines in order to conserve floor space and improve productivity. In the current state, five lines make products. Distinct products are made in specific cells. More than one product is made in each cell. The lines and current dimensions are shown in Figure 1. The sales forecast from marketing predicted that demand would go down for products made in cells C, D and E. Using these projections, management decided to combine the products made in C, D and E into one cell. The manufacturing plant has a warehouse that stores all incoming and in-house fabricated materials. The current space was insufficient due to increasing business requirements. The location identified for expanding the warehouse had 7,200 square feet. The new space identified for relocating cells and accommodating three new straight line cells was 94 feet by 36 feet, or 3,384 square feet. The new location was 53 percent less than the current space taken up by the three cells. The redesign team measured the conveyors and the space required for storing the parts necessary for assembly and incoming and outgoing materials. The footprint for the proposed layout is shown in Figure 2. The challenges in combining three cells into one included the presentation of materials at the point of use for different product lines. In the previous cells, materials like small parts, fasteners and gaskets were kept in bins and staged in racks at each workstation. All purchased, manufactured and painted parts are kept in a central warehouse, which plant workers call a “store.” Large and medium manufactured and purchased parts were kept in baskets. Some of these parts were painted. The redesign team decided to modify the current system and make it more flexible by staging materials in carts that can be rolled in and out of work cells. As each cell made distinct products of various sizes and shapes, the redesign team decided to stage all parts in three carts in the new location. The number of carts had to be restricted to three because the work cell was going to be reduced in length. The carts were designed to facilitate presentation of parts at the point of use at each station along the assembly line. A total of nine carts (three for each combined cell) were found to be adequate for the new cell. Before designing the carts, the redesign team analyzed the family of parts used to make all the fixtures planned to be assembled in the cell. To improve this process, the redesign team scheduled a kaizen event with involvement from production, supply chain, planning and IT. The result was a decision to use computer software to process orders.